@ultimatemegax and 4Tran, thanks for the explanation. So it boils down to the image and reputation. Still sounds pretty silly because KyoAni isn't obligated to pandering to one group, they're a profit minded company first and foremost not some auteurs. They will generally go where the money is and diversifying doesn't mean the studio will abandon it's previous audience anyway. It is also because women are actually quite a powerful force in the matter of purchasing power. Especially in Japan. The paranoia is also caused by the fear that women are perhaps better customers, and that the male audience would lose KyoAni permanently. This is of course unfounded. Why selling to half the population when you can sell to everyone? But paranoia isn't meant to be logical. Alterations to suit you? Rather than following the theme of the source material? You demanded music. K-On as a manga was never about music. KyoAni made an adaptation that follows the manga. Not telling you to like it or anything, but K-On was successful at what it does. The people who were suppose to like it, liked it. And the same will go for Free!. Missing the point. You make it seem like they were coerced and enslaved into adapting the source material as is. They weren't. They chose to take on the project and chose to adapt it in the manner they did. Believe me, there were plenty of alterations from the original 4-koma, so they could have altered in other ways as well. And to that point, the show with the highest combined spring pre-order sales is the heavily fujioshi targeted Uta no Prince sama. Last edited by Iron Maw; 2013-05-01 at 03:03. They created K-On the way they wanted to make it, true. But you can't claim they made the wrong choice. It was a successful franchise with dedicate fans. The fact that it wasn't about the music didn't make it a bad show. It just means people looking for music would have to go elsewhere. What did you think they SHOULD have made? For me, K-On! creates a feeling, atmosphere I like. Also I'm sooo addicted to their music even though most tracks never were in anime, but it is possible to imagine the characters while listening. Please KyoAni, don't fall back on any of these. I might just start screaming into pillows on a regular basis if any of these happen. I'd still rather take those than more Chuunibyou though, but I guess that's already out of the window. Always looking for cool people to talk anime/games with! After watching the PV a couple of times, I can't say I'm very sold on the visuals. I know, it's a PV and we shouldn't judge, but still. The colour design is kinda generic. Reminds me of Chuu2. What happened to the subdued greatness of Hyouka? The AMAZING lighting of this CM that relaxes the eyes? It's way too saturated, it jumps out at me. Maybe the tone of the series is supposed to be lighthearted and whimsy, but they can pull that off np like in K-On!! and Tamako Market. There's something about the skin tones of the guys, about the backgrounds, that I can't quite digest. Searching a bit, the colour design of Free! appears to be done by a first-timer, Yuka Yoneda. It reminds me the palettes Akiyo Takeda used for Chuu2 and the KEY shows. Don't like it, K-On!(!) was much better for Takeda. The backgrounds don't receive a lot of focus here, so I won't say anything, but it's a bit disappointing that Shuhei Okude, the insane art director of Hyouka that was directly involved with the egregious amount of insane BG art for that show, is not going to be the art director. Jouji Unoguchi did Nichijou and FMP, and he seems to be pretty solid. Maybe Okude comes back for Kyoukai? I hope so. As for the animation itself, it will probably be very good with Nishiya being chief AD and Animation DO helping out a lot, as well as having a separate team exclusively for water sakuga. But the PV leaves me a bit cold. It's standard Kyoani, no particularly noteworthy approach or cuts, and no proper water/swimming to speak of. But well, at least I can say that the animation is the aspect for which PVs are the least indicative, so fingers crossed on this one. Hopefully, Hiroko Utsumi can manage her resources well to deliver a solid look for Free!. We'll see what she's made of, and if she holds up to all her promising background as enshutsu. I'll jump in and take a quick look when Free! airs. If it's successful, I demand an Olympics-themed OVA spinoff starring the characters. I think it'd be cool to tie the series in with Rio de Janeiro 2016. Who's with me? 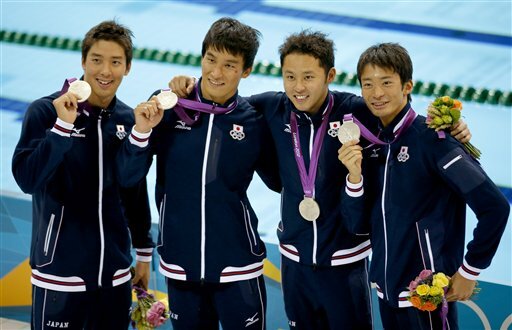 Members of Japan's swimming team at 2012 London Olympics...now imagine the Free! guys at Rio! Last edited by zztop; 2013-05-01 at 10:13. One of the reasons why I really liked K-On was the fact that it wasn't all fanservice and stuff. You don't have to show T and A necessarily or something like Key's doomed romances to have a successful show. Even if it was, the outrage would be just as silly. I don't know about you guys but I've already made this my new favorite sports anime. Right after Prince of Tennis. Location: Somewhere nice and quiet. The way some people are reacting now is already ridiculous. 1. KyoAni is a desirable studio. You may not like the subject matter they animate, but they do good work. This is not in dispute. 2. KyoAni maintains their reputation by limiting their output. This means if there is a type of anime you want KyoAni to make, and they don't make it this season, it means you won't see anything else from them for 6 months. Despite popular claims that say everything they do is the same, there are a diverse group of fans who all want KyoAni to animate shows catering to THEM specifically. This mean any and every new release would anger large groups no matter what the show is. All because they don't want to wait another 6 months to gamble for a show they like in the next release. Free! actually adds new fans to the works. There were always female fans, but no doubt people who never heard of KyoAni will now join the already large fanbase. And this means even more cramped internet arguments on what KyoAni should make. Fans hate healthy competition, they would like total control over a franchise like how IdolM@ster is. The ironic thing? Studio Do will almost certainly improve the output of the KyoAni studio overall by adding more employees. So we should be celebrating. But well, fans can be blind to good news. Oh I don't doubt their aesthetic skills. But it's like hating upon a popular and skilled PIXIV artist for not painting the kind of illustrations you want....They do what they want to and that's that. It's not as if you can control them so why bother getting worked up no? There's tons of other studios around doing good work too...The Sunrise division that made Horizon, UFOTable, Shaft, Silver Link (IMO) etc. The key difference, as I say, is output. For other studios, you can always imagine your favourite show is just around the corner. But with KyoAni once they announced a show, it means any other show people want is pushed back. This generates unique levels of stress and makes different fans turn on each other like mortal enemies. Just my opinion. Fans can be emotional and silly.